A Boystown resident was robbed of $100 cash around 3 o'clock this morning at Belmont and Broadway. When officers met the victim at a nearby Walgreens, he told them that the offenders, described only as black males, ran south on Broadway and then east on Briar Street. Last night's conclusion of the Blackhawk's season resulted in significantly less damage to area businesses than last year. Mainly because they lost, of course. Only one business suffered broken windows after the team lost to the Los Angeles Kings in overtime last night. 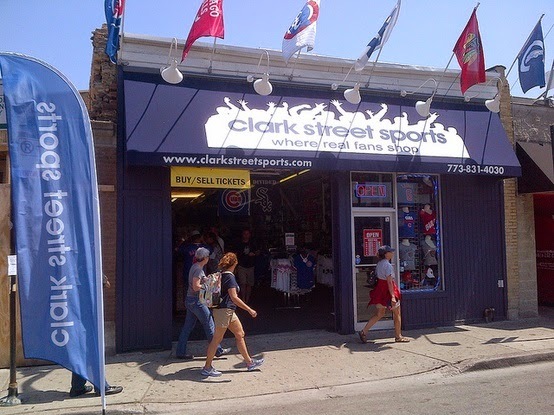 Officers found a window at Clark Street Sports, 3465 Clark, shattered at 11:45 last night. When the Blackshawks won the Stanley Cup last June, a small group of "celebrants" broke away from police lines and broke the windows of about 30 storefronts on Clark Street south of Diversey. CWB captured much of 2013's damage in a photo series. A thief with a unique look is suspected of stealing (or trying to steal) tip jars from at least two area businesses this weekend. The man, described as male, white, 5'10" tall, with tattoos and long hair in dreadlocks, most recently tried to steal the tips from a business near Clark and Diversey around 3:45 Sunday afternoon.